Each year, thousands of people are involved in car accidents in Florida. Victims can suffer a variety of injuries, including concussions, broken bones, and sprains or strains. But burn injuries can be particularly devastating, both physically and emotionally. 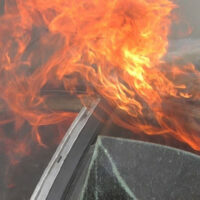 If you or a loved one has been burned in a car accident, contact a Florida personal injury lawyer as soon as possible. A fuel tank is punctured. After puncture, fuel can spill everywhere, coming in contact with sparks or hot metal. If the fuel ignites, fire can spread rapidly. A vehicle carrying fuel tips over. After tipping over, fuel could spread all over the road and possibly ignite. Batteries or radiators explode. Victims can get burned by battery acid or radiator coolant that escapes. Drivers can be burned as they try to extricate themselves from their vehicles, and passerby can be burned simply for being in the wrong place at the wrong time. Regardless of what caused the burn, victims need prompt medical treatment if they hope to make a speedy recovery. First-degree burns damage only the outer layer of skin, the epidermis. Second-degree burns damage both the epidermis and the underlying layer of skin, the dermis. Third-degree burns damage tissue underneath the dermis. Fourth-degree burns damage nerves, muscle, tendons, and bone. Your treatment will depend on the severity of your burn. First- and second-degree burns might only require ointment and over-the-counter painkillers. However, third- and fourth-degree burns can require skin grafts, antibiotics, and possibly amputation of the affected limbs. Medical expenses. You can be reimbursed for any out-of-pocket sums spent on doctor’s visits, hospital stays, surgery, rehabilitation, prescription drugs, or mobility devices such as crutches or wheelchairs. Lost wages. If you couldn’t work while recovering from your burn, you can receive compensation for your lost wages. Lost future earnings. If your injury is serious, you might be unable to return to your old job or to any job at all. If not, you might qualify for lost future wages. Pain and suffering. Burn injuries can cause serious physical pain, and you can receive damages for this physical pain. Mental anguish. If you suffer any emotional distress because of a physical injury, you can receive financial compensation. If a car accident left you with permanent scarring or a lost limb, you can receive compensation for the disfigurement. Each situation is different, and not all accident victims will receive all of the above damages. Only a qualified Florida personal injury lawyer can analyze your case to estimate the amount of compensation available. Burn injuries can seriously upend your life and lead to years of medical care and counseling. At Bundza & Rodriguez, our personal injury lawyers will carefully review your case to identify the correct party responsible for your injuries. Contact us today for a free consultation.